Lots of great things come in threes: wise men, blind mice, musketeers, bears, lots. 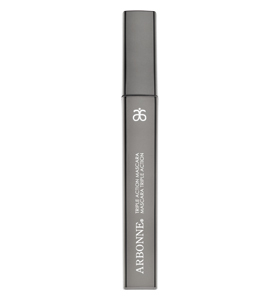 Now joining the list is Arbonne’s Triple Action Mascara, promising to give (1) volume, (2) length, and (3) definition to lashes. At least I’m pretty sure that’s what the “triple” action refers to, because as it turns out (according to the press release), this product is also triply great for being vegan certified, made without gluten (who knew mascaras were otherwise made with gluten? ), and safe for contact-lens-wearers. Arbonne started in 1975 in Arbon, Switzerland and maintains a commitment to using botanical ingredients and abiding by a policy of environmental responsibility in offering high-quality, beneficial products. The policy carries over into harvesting practices, commitment to not testing on animals or using animal by-products, and in source reduction (i.e. using less materials for products and packaging), among other green practices. The Triple Action Mascara has a particularly significant quality: smudge-resistance. Truth be told, after a full day of wear, including a trip to the gym, I did not experience the raccoon look that has otherwise unfortunately resulted from quite a few other mascaras I’ve tried. Moreover, lashes came out defined and absent of clumps for the most part. So long as Arbonne is in your makeup budget ($30), those looking for an environmentally friendly, reliably smudge-proof mascara should purchase one. In fact, you just might want to pick up three. Love this mascara! I wear contacts and this keeps my lashes healthy, doesn’t sting my eyes and lasts! Thanks for featuring it! I love this new mascara! I’ve been using Arbonne skincare product for 6 months and it makes a tremendious difference to not only how my skin looks but how it feels. I wear contacts and my eyes get sensitive. This mascara is revolutionary! This mascara is fantastic! Love it! And, love the fact that it has no animal by-products or petrochemicals in it. Looks good, and it is good for you.